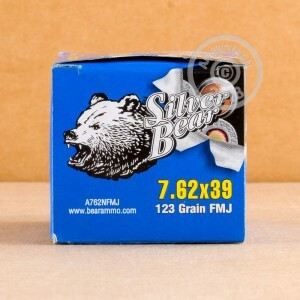 This 500-round case of Silver Bear ammo from the Barnaul Machine Plant in Russia is an excellent, affordable way to keep your SKS or AK fed and happy. Your rifle will appreciate the non-corrosive Berdan primers of these rounds, which won't damage the bore of your rifle and significantly reduce your cleaning burden. The zinc-plated steel cases, while not reloadable, have excellent feeding and ejection and are a great choice for high-volume shooting in this inexpensive cartridge. 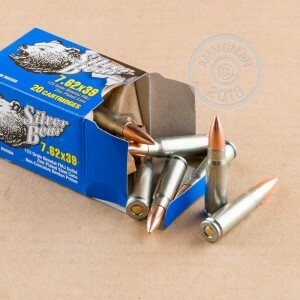 These rounds use a bimetal jacketed 123 grain bullet that has some magnetic properties. Not all indoor ranges allow magnetic ammo, so shoot outdoors or check before ordering! 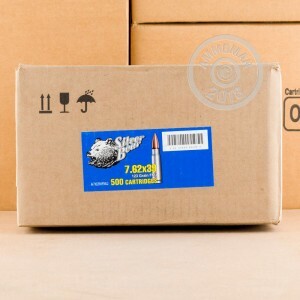 Buy any case of ammo priced over $99 to qualify for free shipping. It's AmmoMan's way of helping case buyers get high volume shooting done without letting the kids go hungry.